please contact us or call 888-282-5002. What's included with my Top Dog Cart? Balanced suspension and towing gear. There are numerous features and accessories you may add to your cart. When requesting a quote, specify the options and custom equipment you are interested in adding to your cart. How long will it take to build my Top Dog Cart? Upon receipt of your deposit, a completion and delivery time will be available. Generally, carts are complete within 3-4 weeks of receiving a deposit. Are Your carts NSF certified? NSF is a business standard recognized by companies around the world. While we do not seek certification, all of our carts are NSF compliant. Please visit the NSF website at: www.nsf.org for more information. Do you manufacture all of your mobile food and concession carts? Yes. We design, build and ship all of our mobile food and concession carts from our Longwood, Florida manufacturing facility. Do you manufacture food trucks and trailers? Presently, we do not manufacture or service food trucks or trailers. Our manufacturing facility is located in beautiful Longwood, FL just a few minutes from the metro Orlando area. If you are in or visiting Central Florida call ahead to schedule a tour of our manufacturing facility. How do I pay for my Top Dog Cart? We accept all major credit cards via PayPal, phone or in person. We also accept cashiers or bank checks and cash. A deposit is required before we begin constructing your cart. Please contact us for details. Financing is also available. How is my cart shipped and delivered? All mobile food carts are shipped via freight. We work with multiple shipping companies to find the best rates and service for your delivery location. The shipping cost is included with your cart quote. We personally photograph and crate every Top Dog Cart to ensure they arrive safely. Depending on the carrier, shipping is typically 2-7 days within the continental United States. International delivery times vary by country. What should I do when my cart arrives? In the event your cart is damaged during shipment, please contact us immediately. What if I change my mind about purchasing a cart? The item must be returned in new, unused condition. The item must be returned in the original factory packaging. View our step by step process for buying a Top Dog Cart, with information including how to choose a cart, what to expect during construction and your payment options. What do I need to do to use my cart for the first time? It is very simple to get your cart up and running. Begin by familiarizing yourself with the included user manual. It will explain all of your cart’s features. Next, locate the water fill area. Add water to the fresh water tank. Then install a propane tank (not included) according to the instructions located inside the cart’s propane tank compartment. Now, turn on the burners and start cooking! How do I clean and maintain my cart? Basic cleaning of your griddle, grill and stainless surfaces is recommended to keep your equipment sanitized. Make sure your Top Dog Cart is cool to the touch before cleaning. We recommend white vinegar to naturally and safely clean your stainless steel surfaces. A stainless steel cleaner, such as Brite Shine Food Grade Stainless Steel Cleaner, may also be used. Make sure what ever cleaner you choose is safe for use on stainless steel food surfaces. Avoid using chlorine bleach, products containing chloride, or glass cleaner. Avoid using abrasive pads as they may cause rust deposits. Never use oven cleaners or abrasive cleansers as they may scratch and ruin stainless steel surfaces. In cold climates, please make sure you drain water from your cart so it does not freeze and cause damage to your water system. Can I remove the griddle? Yes. The griddle on the The Chef (TD 24) and the The Executive (TD 36) carts can easily be removed by two people. How do I attach the propane hose to a propane tank? The propane gas hose on your Top Dog Cart threads to the left. How do I change the water pump battery? Top Dog Carts include a trickle charger in the propane tank compartment. This trickle charger will top off your battery after each use. If the battery needs to be fully charged, you may need to use a automotive battery charger. What kind of vehicle do I need to tow a Top Dog Cart? You only need a standard 2 wheel drive vehicle to tow a Top Dog Cart. What size ball do I need on my vehicle to tow my cart? A 2″ ball is needed to tow your Top Dog Cart. Is the tow bar removable? Yes. When the tow bard is removed, the retractable jack stands keep the cart stable and balanced. How do I secure my cart for towing and travel? Remove the grease tray from under the griddle. Even with the safety pin in place it is possible that the grease tray will bounce loose and fall out while traveling. And if there is grease in the tray during travel it will splash the griddle. If equipped, remove the cart skirt / umbrella. Make sure the griddle and steam table area are cool to the touch before laying the cart skirt or umbrella on them. Make sure the retractable jack stands are locked in place under the cart before traveling. Secure the water fill cap. Can I purchase a spare tire for my Cart? Yes, Top Dog Carts offers spare tires for our carts for sale in our online store. Can I add logos or messages on a custom umbrella? Yes. Vinyl decals can be added to our marine-grade vinyl umbrellas. Can you create a custom sign for my mobile food cart? Yes. 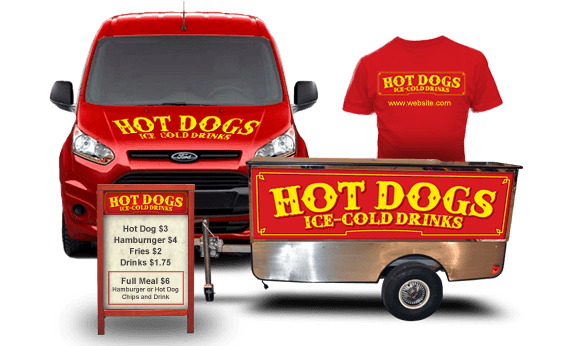 We create a custom signs for Top Dog Cart and vending carts from any manufacturer. We print signs locally or send the finished artwork to your printer of choice – no matter where you’re located. Do you provide marketing and graphic design services? Learn more about our marketing and graphic design services. 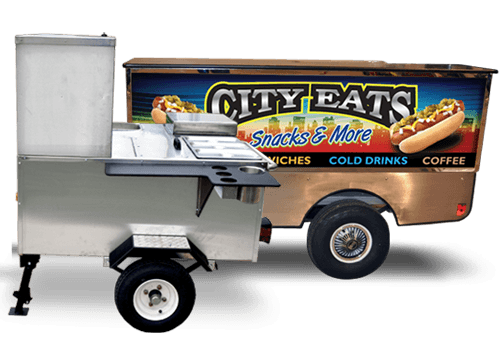 We offer a variety of marketing and graphic design services for mobile food vendors and concessionaires. Can you help me start a mobile food or concession business? View our section on Starting a Mobile Food Vending Business for information about licensing, insurance, and marketing a mobile food business. If you’re starting a mobile food business in Florida, we have a step-by-step guide for getting your license, passing inspection and registering your business here. What are the legal/insurance/licensing requirements? Laws regarding mobile food permits and licensing vary by state, county and country. Before purchasing a mobile food or concession cart, you will need to familiarize yourself with health department regulations in your area. There may be equipment you are legally required to have on your cart in order to pass inspection, such as a certain number of sinks. The health department in the areas you plan to operate in will provide you with information about permits and licensing for a mobile food business. For more information about licensing and permits, please see: How to Start a Mobile Food Cart Business.